Traditional propellor turbines are not the only possibile solution for harnessing energy from wind. Here are a couple more designs, along with my unscientific musings on how they will effect bird strikes. 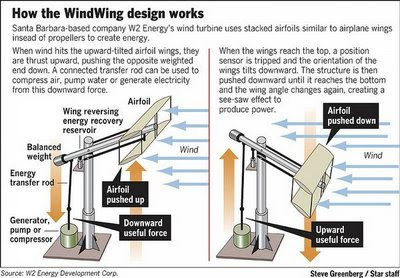 The WindWing was developed by W2 Energy Corporation in California. Wind pushes two sets of wings (it looks like the Wright Brothers' plane) up and down and...well...just read the diagram. How will it affect birds? Well the real question, when thinking about a traditional turbine, is: Do the blades kill the birds or does the tower? As far as I can tell, it's the tower (and the lights associated with it) that's the most dangerous part. However, I think it's safe to work with the assumption that bird strikes are roughly proportionate to the amount of surface area on a structure. How does that bode for the WindWing? Well the surface area of the blades has been consolidated into the wings, and so overall the total surface area of a WingWing is probably at least the same as a traditional turbine. If lights are mounted atop the tower, bird strikes may increase as birds are attracted to those lights because more of the structure exists closer to the tower than on a traditional turbine. Completely unscientific conclusion: At least the same amount of strikes. FloDesign "is a Contract Engineering Corporation built around the application of aerospace technology to new product development." I'd tell you more, but I don't have the login to get into their super exclusive website. Their efficient turbine design just won a prize from MIT. Birds? Hmm. Well the blades are gone, and now the majority of the surface area is placed at the very top of the tower. My worry about this design is that aviation lights are also usually placed at the top of the tower, depending on what the FAA decides. If birds are attracted to your lights, and there's a lot of mass around the lights, there may be more collisions. Completely unscientific conclusion: Probably about the same number of strikes. Holy cow look at that thing! California-based Selsam is a small company with big dreams. That website has a lot more photos, but the basic idea is to replace large, single turbines with a whole bunch of little ones. They can be put in the water, they can be put on top of buildings, and, as seen above, they can be attached to bimps. Operating from my "strikes = surface area" theory, the Selsam turbine would have about the same number of strikes as a traditional turbine. The surface area of the two styles is (roughly) the same, it's just broken into smaller bits on the Selsam turbine. I gotta think, though, that it would be easier to devise a system to repel birds from a relatively contained rope of turbines than from one with a wider reach. Completely unscientific conclusion: Slightly fewer strikes. Magenn Power Inc. wants to float lighter-than-air balloon turbines up to 1000 feet in the air, where wind speeds are stronger and more consistant. According to The Always-Reliable Awesome EverythingSite, Wikipedia, most birds migrate at altitudes between 500 and 2000 feet. 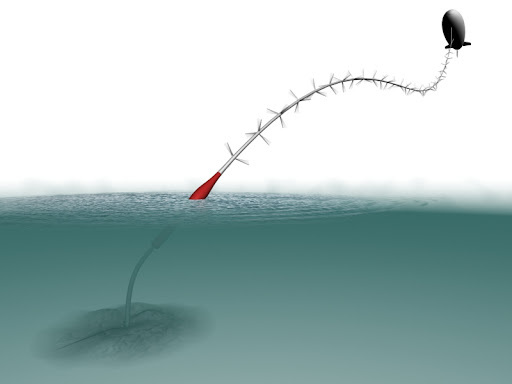 If this is correct, the Mangenn turbine may just float right smack into the middle of the majority of migrating birds. This factor, combined with the consolidation of the mass around aviation lights may have the effect of increasing bird strikes. Completely unscientific conclusion: More bird strikes. So, there you have it. Any other turbine designs out there? Disagree with my off-the-cuff reasonings? Let me know. Correct me if I'm wrong, but my understanding was that towers under 199 feet do not need aviation lighting. So I think that some of the collision risk would depend on how tall each of these things are. I think another factor to consider would be efficiency. If a particular turbine design does a better job of converting wind into electric power, then fewer would be needed, so there would be less overall tower surface area in a wind farm, even if individual towers had more surface area than another design. Good point, John. The first sentence of the FCC antenna lighting regulation I linked to in the post says "The FCC has been given the authority by Congress to require the painting and/or illumination of antenna towers when it determines that such towers may otherwise constitute a menace to air navigation." That pretty much means they can decide on lights or no lights for any tower they want. I don't see anything in that regulation about a 199 foot minimum, but I don't know about other regulations. I'm also not sure if the antenna regulations have been adapted to apply to wind turbines. Based on this language, though, it looks like the FCC can put lights on towers of any height, if they decide it's a potential hazard.